PIXE E-Liquid Review - Daily Vaping Deals & The Best Vape Product Reviews at Vaping Cheap! In this e-juice review, we’ll be covering the entire line of Pixe e-liquid! There are four different flavors available, and each flavor offers a unique candy vape experience that has the same “pixies” base implemented. All four of these vape juices have a VG/PG ratio of 70VG/30PG, which is perfect for sub ohm tanks, RTAs, RDAs, and RDTAs! Each e-liquid offered in the Pixe E-Liquid line is offered in a large 120ml Chubby Gorilla Bottle, and is available for under $20! In addition, there’s a 4 pack bundle which includes all flavors for only $40.00, bringing the price down to each 120ml bottle to only $10! That’s an excellent deal for e-juice, and we’re glad to see more and more e-juices available at affordable prices. The nicotine strengths available are 0mg, 3mg and 6mg. Before getting any further into this review, we’d like to thank ejuice.deals for sending this line our way for the purposes of this review. We will provide you with our overall thoughts about these flavors and let you know whether or not we recommend them! Remember, taste is subjective, so what we may like you may dislike and what you like we may dislike. We will first go over the specific mods and atomizers used to test each of these flavors and then continue on to the review of Pixe E-Liquid! Click Here to Check Out PIXE E-Liquid! Flavor Description: Strawberry Pixe by PIXE E-Liquid features juicy bunches of strawberries collected by delicate yet aggressive pixies. These yummy berries are squeezed into a smooth e-liquid and immediately bottled for freshness. This is a really good strawberry candy flavor, and definitely a favorite from this e-juice line. On the inhale, you get a strawberry candy flavor. On the exhale, you get a strawberry pixie candy flavor with a slight tart note. The tart is surely from the strawberry, and it does add another element to this e-liquid so it differs itself from other strawberry candy flavors on the market. This is a pretty straightforward vape; therefore it’s very easy on your palette. The flavor is not too strong nor is it light, making it great to vape all day. In addition, it’s not overpowering sweet either, which is common with a lot of candy flavored vape juice, which is certainly a good thing in my opinion. I do want to mention that Strawberry PIXE EJuice was great to vape right out of the mailbox, and didn’t need any steeping whatsoever. The throat hit is silky smooth, and the vapor production is as you’d expect with a 70VG/30PG blend. Overall, Strawberry PIXE EJuice is a solid strawberry candy vape that is considered an all day vape at Vaping Cheap. In addition, it’s pretty spot on to the flavor description. If you’re looking for a strawberry candy flavor that’s not overbearingly sweet, then look no further! Flavor Description: Blue Raspberry Pixe by PIXE E-Liquid features rare blue raspberries collected by delicate yet aggressive pixies. These sweet and sour berries are squeezed into a smooth e-liquid and immediately bottled for freshness. I’m a big fan of blue raspberry candy flavor e-liquids, so I was excited to try this flavor. I haven’t really tried a blue raspberry pixie flavor before, but have had many blue raspberry candy flavors. The pixie flavor does add a twist to the entire vape, and it does make this e-juice much different than other blue raspberry flavors. On the inhale, you get a blue raspberry candy flavor. On the exhale, you get a blue raspberry pixie candy. It does taste like a blue raspberry pixie, but I think it’s just a little too heavy on the “pixie” flavoring. On the previous flavor reviewed, it was noticeable, but on this one it’s much more noticeable, where it tastes a bit overpowering. You can still easily taste the blue raspberry, but adding too much of “pixie” can make it taste a bit dry. The throat hit on this e-juice is very smooth, and the vapor production is great. While this e-liquid is not my favorite of the line, it’s still a decent blue raspberry candy vape, especially when considering the price. If you’re a fan of this flavor profile, then we do think it’s worth giving a shot, you can’t really go wrong for the price. Flavor Description: Rainbow Pixe by PIXE E-Liquid features sweet colorful candies collected by delicate yet aggressive pixies. These candy favorites are squeezed into a smooth e-liquid and immediately bottled for freshness. The 70/30 blend will have you puffing huge clouds that the pixies acknowledge as thanks for their hard work. After reading the flavor description, I wasn’t sure exactly what to expect with this vape juice. I can say, however, it’s really good! On the inhale, you get a mixture of fruit candy flavors. On the exhale, you get the same mixture of fruit candy flavors with a hint of “pixie”. This e-juice is sweet, but not too sweet, just enough to satisfy your sweet tooth! Honestly, it was hard to pick out the different fruit candy flavors as it’s blended quite well together. I can pick out just a few which are lime, orange, faint hints of pineapple and some others. It simply tastes like if you threw a bunch of fruit candies in your mouth, and added some pixie. The specific blend of fruit candies is absolutely delicious, and every time you take a vape you might taste something more up front than you did before. Just like the other flavors, the throat hit is very smooth and the vapor production is solid. Overall, Rainbow PIXE EJuice is a great fruit candy vape, and another favorite of ours from this e-liquid line. If you’re looking for a candy eJuice that has a ton of different fruit flavors in it, then definitely pick up a bottle of this one, you won’t be disappointed. Flavor Description: Grape Pixe by PIXE E-Liquid features juicy bunches of grapes collected by delicate yet aggressive pixies. These yummy bunches are squeezed into a smooth e-liquid and immediately bottled for freshness. I know there are some grape flavors on the market today that tastes like medicine, and I’m happy to say, this is not one of them. Grape PIXE EJuice is a spot on grape pixie candy, and I was pleasantly surprised by how close it tastes to the actual candy. On the inhale, you get a grape candy flavor. On the exhale, you get a grape pixie candy flavor. Just like the previous 3 flavors, this one isn’t too sweet, and just sweet enough in my opinion. Just like Strawberry Pixe, this one is pretty straightforward as well, making it easy on the palette. There’s no flavors you have to look for, and you can taste everything in the flavor description. The throat hit is incredibly smooth, and the vapor production is solid, especially for a 70VG/30PG blend. This also vaped great in both a sub ohm tank and dripper. All in all, Grape PIXE EJuice is a spot on grape pixie stick flavor, and just might be our favorite of the line! If that’s something you’re looking for, then definitely pick up a bottle of this e-liquid! 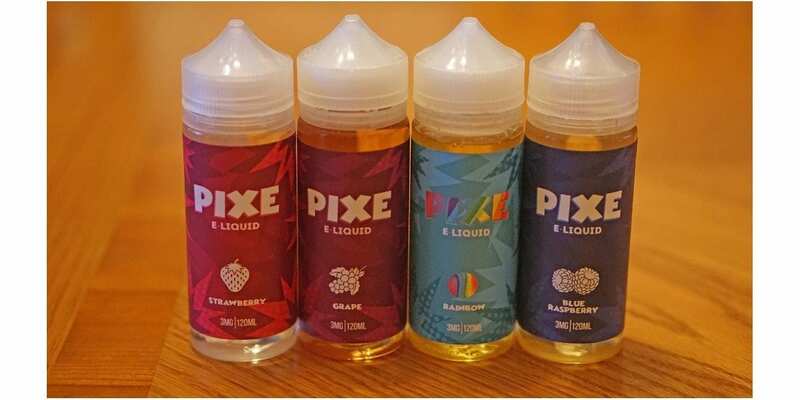 In conclusion, PIXE E-Liquid offers 4 great candy flavored e-liquids that are pretty spot on to the flavor description, especially the strawberry and grape. It was hard to choose between our top 3 flavors to choose our top favorite, but I can surely say that our top 2 favorites were the strawberry and grape. The Rainbow was a close second to the grape, but the authenticity of the grape is what really edged it. The throat hit on all four of these flavors were very smooth, so we can definitely say they’re using great quality nicotine. Something else worth mentioning with these flavors is that none were overwhelming sweet, which is something a lot of candy vapes suffer from. These e-liquids were just sweet enough to satisfy your sweet tooth. At under $20 for a 120ml and the 4 pack bundle being only $40, we can easily recommend giving PIXE E-Liquid a shot, especially if you’re a fan of candy flavored e-liquids! At only $10 per 120ml bottle with the 4 pack, you really can’t go wrong! We hope this article helps you find your next all day vape! Feel free to leave any questions or comments below! We always love hearing back from our subscribers! Thanks for reading!